Rusty Eck Ford offers a variety of lease options on new Ford cars, trucks, and sport utility vehicles (SUVs). We have a wide range of vehicle lease options to fit your needs and budget. The experts at Rusty Eck Ford's finance department can help determine if leasing your next vehicle is right for you. 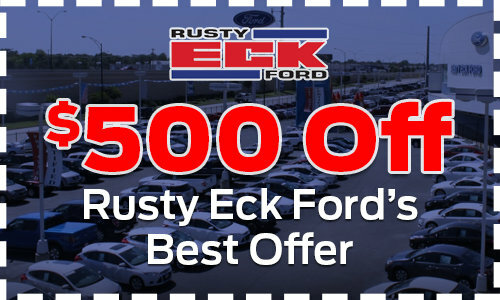 There are a number of benefits to leasing a new Ford vehicle at Rusty Eck Ford. Leasing offers flexible terms and lower monthly payments than a typical car loan. Leasing is also great for customers who drive less than 12,000 to 15,000 miles per year, want a low monthly payment, and like having a new car every few years. Browse our frequently asked questions or call (316) 221-3583, and we can figure out if leasing your next vehicle is best for you. Q: How many miles per year can I drive with a lease? A: Most lease agreements are from 10,000 to 15,000 miles per year, though higher mileage agreements can be arranged for an additional monthly fee. Q: What happens if I go over my lease mileage? A:Your lease agreement has a per mile amount that will be charged for any excess mileage, or you may have the option to purchase you vehicle at the end of the lease to avoid the charge. Q: Can I purchase my vehicle at the end of my lease? A: Though it depends on your lease terms, you can typically purchase your vehicle at the end of the lease if you want. Financing can be arranged at Rusty Eck Ford. Q: Can I trade in a vehicle to use as a down payment on a lease? A: Yes. Just like financing a car, you can trade in a vehicle to use as a down payment on a leased vehicle. A higher down payment will lower your monthly payments.